Thinking of a trip to South Australia and its capital, Adelaide? You could check out the area of Ridgehaven, situated 14 kilometres northeast of the city. Do you have some time in Adelaide? There's heaps of things to see, including the Victoria Square, Government House and Rundle Mall. Stop and grab a snack or meet some friends at Tea Tree Plaza. The Highlander Hotel is perfect if you want to rest your head nearby. Wine lovers won't want to miss Bird in Hand Winery. Hear about the different types of grapes and the bottling process used, then see which blend you prefer during a tasting session. Try the Sfera's Park Suites & Convention Centre to stay close to this spot. Not really a morning person? Don't worry, you'll find a variety of excellent cafes in Ridgehaven. A steaming hot coffee and pastry at Muffin Break is the perfect way to get yourself going. All of that sightseeing certainly takes it out of you. Luckily, Australia's Pizza House plates up delicious meals that will be sure to satisfy even the hungriest of travellers. And of course, you haven't fully experienced Ridgehaven until you've rubbed shoulders with the locals at the neighbourhood pub. Here, Clovercrest Hotel is where you'll want to go. Demand for hotel rooms in Ridgehaven can sometimes exceed supply. But there's no need to tear your hair out! 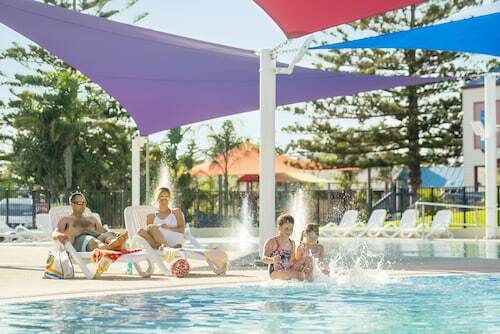 You'll find a few awesome places in nearby neighbourhoods in the Pooraka hotels guide and the Wotif Mawson Lakes hotels guide. Pooraka is found 7 kilometres to the west of Ridgehaven, and is home to recommended accommodations, such as the Pooraka Motor Inn and Pavlos Motel. Alternatively, you could check out Mawson Lakes, home to the Quest Mawson Lakes and Mawson Lakes Hotel & Function Centre. Mawson Lakes is 8 kilometres to the west of Ridgehaven. Wotif has you covered, from hotels and flights to car hire and activities, when it's time to stop dreaming about your Ridgehaven holiday and start experiencing. How Much is a Hotel Room in Ridgehaven? Hotels in Ridgehaven start at AU$103 per night. Prices and availability subject to change. Additional terms may apply.